Jewelry Design Showcase specializes in wedding bands for all tastes and style choices. As a family run company by the Dannunzio family for 62 years running, JDS seeks to please customers above and beyond their wildest dreams. Made with only the highest quality metals and jewels, anyone is sure to find their perfect wedding band, engagement ring, or anniversary ring that will last them a lifetime. Select designs and collections that reminisce the days of old craftsmanship, with styles and designs that stand the test of time. From the initial design to the final product, Jewelry Design Showcase wedding bands are sure to bring happiness to you and your loved one. Jewelry Design Showcase wedding bands collection offers a unique selection of elements with which to design your ring. Choose between white gold or platinum metals, bands with or without stones, custom stone shapes, and the stone setting to create your custom band. JDS also features anniversary band options for the renewal of vows or a milestone anniversary. One special feature about this collection is the choice of adding birthstones to your desired band. 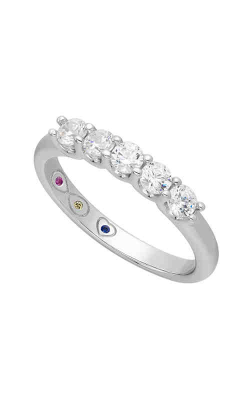 Set birthstones within your wedding band to represent you and your spouse, for a romantic touch. Add your entire family’s birthstones for an anniversary band that will bring tears to your wife’s eyes. The engagement and anniversary collections are both bold and feminine. Adding birthstones to the band will add a colorful and quirky touch if that is the style you prefer. If you prefer a more simple design, then opt out of the stone setting and choose a plain band with limited diamonds for a clean look that will still shine bright and beautiful. All of the Jewelry Design Showcase wedding bands are patented designs, so you won’t find them anywhere but here! Why Shop for Jewelry Designer Showcase Wedding Bands at Medawar Jewelers? When choosing to shop at Medawar Jewelers, you are choosing the best customer service in the jewelry industry. With over 80 years of experience in the business, Medawar is family owned and holds the same values today as we did when our first shop opened in 1920. We take pride in providing only the highest quality jewelry in Michigan, along with unparalleled design consultations. Stop by for a visit at one of our stores in West Lansing, Okemos, Jackson, Portage, and Brighton. We would love to see you! Have a piece of jewelry you need to repair? We do that too!